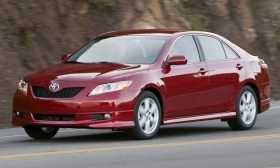 Car thieves took a liking to the 2009 Toyota Camry, according to NHTSA. DETROIT -- The Audi S8 and the Toyota Camry stood out among the most stolen 2009 passenger vehicles in a report from the National Highway Traffic Safety Administration. The just-released report tracked theft rates for all new 2009 passenger vehicles stolen that year. It excludes most SUVs and pickups, so the Cadillac Escalade won't make this list. The S8 had the highest theft rate, with 8.81 thefts per 1,000 vehicles produced. But the car has low production numbers -- only 227 came off the line in 2009, and two of those were stolen. The Camry, which was 2009's best seller, was the most stolen passenger vehicle from a purely statistical standpoint, with 781 copies swiped. Meanwhile, Ford's Mustang Shelby GT was second to the S8, with 8.61 vehicles per 1,000 stolen. That year, 581 were made, and five of those were stolen. In third place was the BMW M5, with 7.58 per 1,000 copies stolen, fourth was the Dodge Charger, with 6.47 cars stolen per 1,000 copies, and fifth was the Honda S2000, with 5.60 per 1,000 copies stolen. Rounding out the top 10 were the Mitsubishi Galant, the Chrysler 300, the Infiniti M35/M45, the Cadillac STS and the Mercedes-Benz CL-class. The overall theft rate for 2009 declined to 1.33 per 1,000 vehicles, which is a 21.3 percent drop from the 1.69 thefts per thousand in 2008. NHTSA attributes this drop to a variety of factors, including increased use of antitheft devices such as immobilizers and the marking of vehicle parts. It also cited an improvement of prosecution efforts by law-enforcement officials and increased measures for public awareness. Of new cars that had at least one theft in 2009, thieves were least drawn to the Mercury Mariner, which saw just two of 25,682 new copies stolen, for a 0.08 per 1,000 theft rate.